- 0.4 to 30.0 m/s, m/s, ft/min, km/h, knots, Data hold, 18 mm LCD. Owing to the presence of our expert team members, we are able to offer a wide range of Digital Anemometer. In order to keep pace with the never-ending demands of customers, we are involved in offering a wide range of Wind Speed Meter. 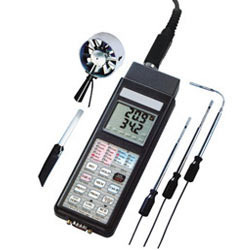 We trade a wide range of Digital Anemometers. - The portable anemometer provides fast accurate readings with digital readability and the convenience of a remote sensor separately. - Multi-functions for air flow measurement: m / s, km / h, ft / min, knots. - C, F temperature measurement. Measurement Units : m/s, km/h, ft/min, knots. Display: 18mm (0.7") LCD (Liquid Crystal Display), 3 1/2 digits. Power Supply: DC 9V 006P, MN1604(PP3) battery (Heavy Duty Type) or equivalent. 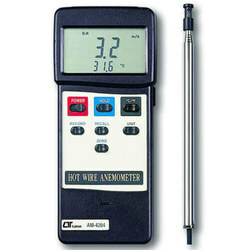 Digital anemo meter dot 783 is 3 1/2 digit a compact portable precision instrument.